so how do you find work that rewards you with money and meaning? WORK, along with TIME, MONEY and LIFE, is one of the four interlinked foundations of humanity’s journey here on this earth. At its simplest, we devote some of our waking hours to work. Work earns us money. Money gives us the fuel to live life. Of course, its a bit more complicated than that. HERE AGAIN is Maslow’s hierarchy of needs. We are probably all familiar with the concept, which suggests we have a pyramid of needs starting with basic food, shelter and safety at the bottom before becoming more selective and personal towards the top of the pyramid. WHICHEVER WAY you look at it, the top of the pyramid isn’t food or shelter, or even experience. The top of the pyramid is about fulfilment, meaning, empathic connection. That being the case, we probably don’t work just for the money, to fulfil our lower order needs. WE SPEND over a third of every waking week travelling to and at work and just to do this for the money must be disheartening to say the least. More likely, we spend so much time at work to achieve in part some of those higher order needs. FULFILLMENT, self-esteem, creating change for the better, social benefits, meaning and happiness are all less clear cut but equally important reasons why we work. And anyway, even if happiness is a pre-requisite for good work, its also an outcome and we tend to instinctively know money does not buy happiness. In fact, RESEARCH by Ed Deiner, Dave Myers and others shows that, as you earn more money, up to around $75,000 pa, happiness increases. However, after that happiness plateaus and earning more has little impact on happiness. In fact, Dave Myers found that over one third of the wealthiest people in the US were less happy than the average American. And at the societal level the same applies. The wealth in the United States as an entity doubled between 1957 and 1995, but the happiness levels didn’t change. A wealthier society doesn’t, it seems, guarantee a happier society. In fact, the CORE DRIVERS of happiness for those with incomes in excess of $75,000 pa are social connection, community, making a difference, helping others. So, we work to achieve meaning and happiness as well as money, and this BRINGS US BACK to the subject of this presentation: how do you find work that rewards you with money and meaning? At this point I want to bring in Kim LeClair. Kim runs a business called East Willow in Chicago in the US. Kim is a certified coach with a background in psychology. She is also a web designer and expert in helping individuals as well as small businesses to develop and communicate those all important messages which lead to businesses or assignments that produce both money and meaning for her clients. But let Kim tell you about herself in her own words first of all. In this video clip describes a number of ways we can broaden our horizons and gain insights into your direction. She looks at the value of assessments such as Myers Briggs.The importance of just doing it. What works is what we will do. if it doesn’t work, try again. No instant answers, takes time, a lot of learning. So, Kim mentioned a book called DO WHAT YOU ARE by Paul Tieger which lists a vast range of opportunities linked to your Myers Briggs rating. This whole question isn’t easy, especially for today’s younger generation, and when I meet children of clients or speak at school workshops I often recommend they sit down for a day to WATCH TED talks to really broaden their horizons and discover opportunities that they might never have thought of before. I also feel that it is important to look for opportunities, not just jobs. By opportunities I mean problems that need solving. TAKE JEFF AND ANDY, for instance. They were tired of overpaying for overdesigned razors, and of the time wasted visiting a chemist to actually buy them. When they asked around, they learned lots of others (including me) were upset about the situation too, so they decided to do something about it. THEY LAUNCHED HARRYS, a shaving subscription service whereby high quality, low cost shaving kits are delivered to your door at your preferred frequency. JEFF AND ANDY had a problem. They thought of a solution and in so doing identified an opportunity to solve the same problem for thousands of others. In this clip, Kim highlights phrases such as ‘I should’, which ring warning bells. Weighty comments glossed over.No one listens. The secret sorrow. Importance of talking to someone who listens intently, who will circle back to emphasis the importance of a comment. In this video clip Kim talks a little more about Myers Briggs. She also talks in detail about Strengthfinder, helping you to go where you are strong, not seen all your time trying to cover your weaknesses. KIM WENT INTO some detail about finding your strengths and using tools such as Strengthfinder. However, there is debate at the moment about whether one should concentrate on ones strengths and use these as a foundation for a career, or alternatively look at ones weaknesses and gaps that might prevent you doing what you really want to do, so I challenged Kim on this. Kim discusses the issue in depth, highlighting the difference between strengths and talent. SO NOW YOU HAVE worked out who you are and what you want to do. The next question is actually getting there. In other words, identifying the right people to talk to and communication your message – what people often refer to as marketing! Both Kim and I agree that, as an individual you should think of yourself as a business. That means you market yourself in the same way you might market a product or service. You have your own brochure (as well as a CV), website, social media connections etc. And be prepared for opportunities to come in many forms, including regular, paid full employment. They may also come in the form of portfolio lives, multi-tasking, project work, partnerships, volunteering – anything that puts you somewhere on the spectrum between financial rewards and meaningful rewards. So Kim, if I were a client, how would you help me to connect and communicate my ‘personal brand’ to my target audience? Kim and I finished our interview talking about a range of related subjects, and you can find this discussion elsewhere on this topic page of the members site. I WANT TO FINISH this presentation by expanding a little more on the subject of rewards. I’ve already highlighted research about the links between money and happiness and you will know instinctively that its not all about money. It is important, though, to have a clear idea of what you want to get out of the hours you spend ‘at work’. APART FROM MONEY, THESE could include becoming part of a community, the ability to be of service to others, being a change maker, making a difference and solving problems. It may of course be that you can’t get everything from one assignment. 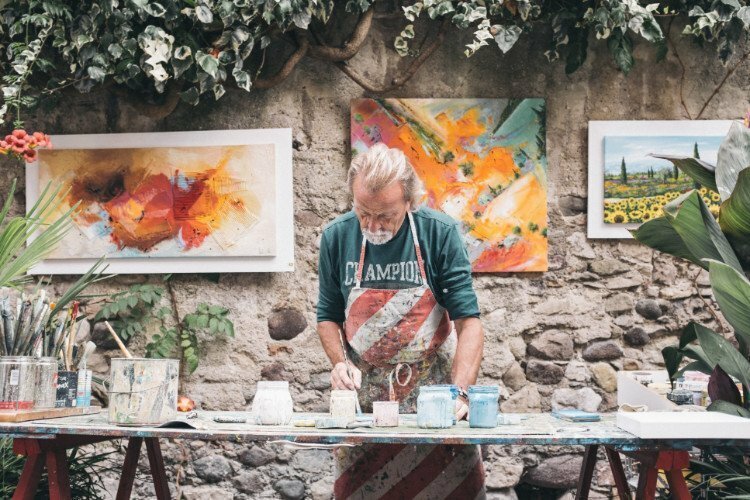 This is where living a portfolio life comes in with some elements of your portfolio bringing in the money, and others providing some of the other benefits you seek. Its an iterative process and may not necessarily happen in this order all the time. However, it will make life considerably easier when looking for work that is both financially and meaningfully rewarding. THATS IT FOR this presentation. You will find more on the page of the Living Money members site. Finally, of course, i would like to thank Kim for her wonderful and enlightening contribution to this subject. YOU CAN FIND more about Kim at eastwillow.com and listen to the rest of the call on the Members site in which we discussed a range of topics including finance, confidence, personal development, perfectionism, the counterculture of thinking about work in a different way and generational and cultural differences.